Intel® currently has two offerings on the host fabric interface (HFI) adapter side these include a PCIe x8 58Gbps adapter and a PCIe x16 100Gbps adapter, both of these are single port adapters. 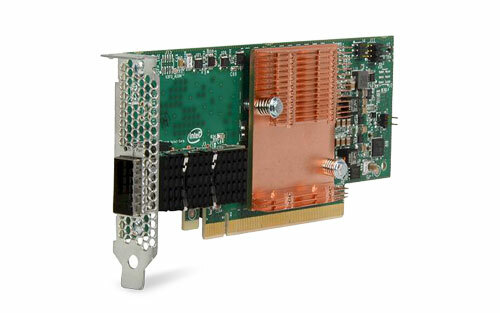 Both HFI’s use the same silicon so offer the same latency capabilities and features of the high end 100Gbps card. Along with the physical adapter cards, Supermicro will also be releasing a range of Super Servers with the Omni-Path fabric laid down on the motherboard, this will offer a tighter layer of integration and enable a more compact server design. To take this design even further Intel® have announced that they will be intergrading OPA on to future Intel® Xeon® processors, this will reduce latency further and overall increase performance of all applications. Efficiency – large MTU support (4 KB, 8 KB, and 10KB) for reduced per-packet processing overheads. Improved packet-level interfaces to improve utilization of on-chip resources.